These have been out for a bit, but new headphones come out every other day so you’ll have to forgive us for not having noticed. 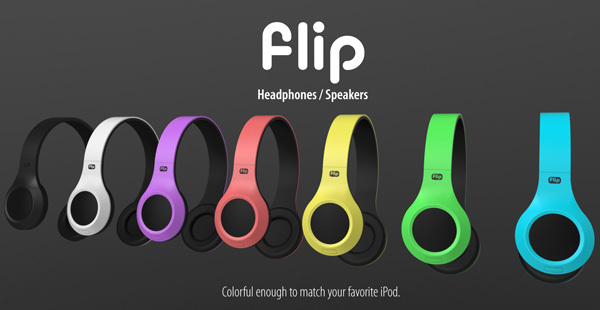 And we’re only discussing the Flip headphones now because, well, we hate them and feel like ranting. The gimmick here is that in normal listening mode they’re just another pair of headphones, but flip them around and they become a pair of speakers. Yeah, they’re specifically designed so you can walk around with your music blaring around your neck, gracing your surroundings with your undoubtedly wonderful taste in music… These are the headphones that allow you to be ‘that guy’ that everyone at the bus stop just wants to punch, but is too civilized to do so. Unlike you. You… you aren’t like most people, you need attention because maybe your parents didn’t love you enough as a child. We don’t know, but if we see you wearing some Flips, we’re going to… really glare at you. They’re $120. Now if you don’t believe us about how awful an idea this is, watch the below video and see if it isn’t the most cringe worthy minute you’ve ever seen.